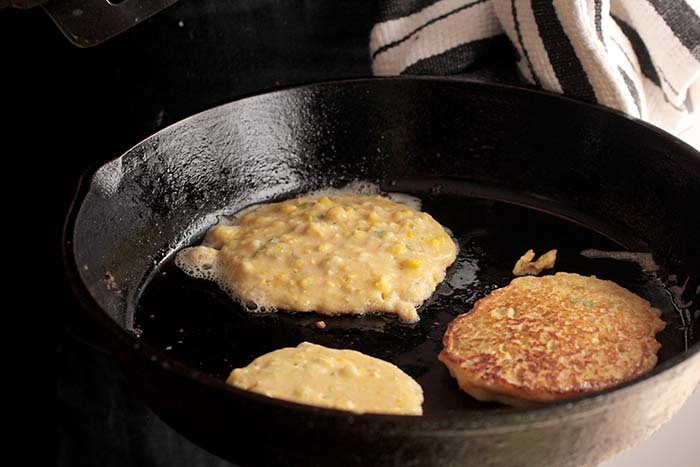 These little corn cakes are quite tasty – we’ve made them during the winter months with frozen corn but I have to say, made with fresh, just-picked, milky sweet corn, a little splash of kefir for a bit of tang, a little heat from green chilies and topped with a guacamole veggie fusion – these are something really special. They’re so good, we’ve served them at dinner parties but still easy enough to have on a weeknight; serve them as a vegetarian dish with a side salad, add a fried egg and enjoy for breakfast or brunch – or pick up a rotisserie chicken and dinner al fresco is ready in under 30 minutes. 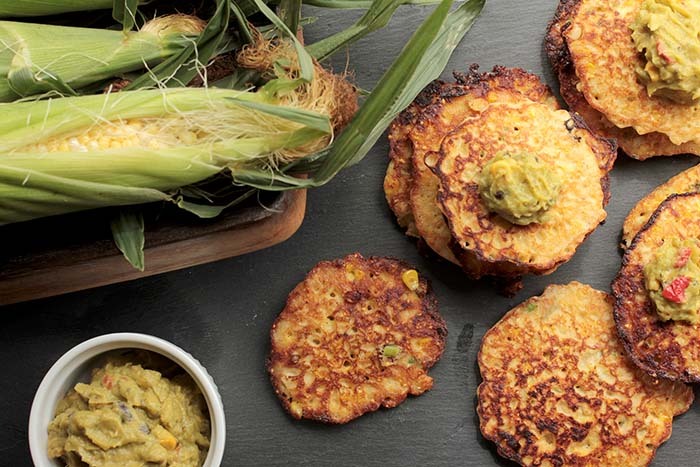 The original recipe comes from Diana Henry’s ‘A Bird in the Hand’; I’ve made a few minor tweaks and converted these corn cakes to be gluten-free and added a dollop of Sabra’s new Veggie Fusions guacamole – so good. Living in the Midwest, it’s not always easy to find great avocados in the store; they’re either rock hard or completely gone – and on those occasions I hit the jackpot, they have been expensive: $3-$4 each – yikes! It’s nice to know that Sabra’s Guacamole is made with perfectly ripe, fresh, Haas avocados; the Guacamole Fusions are mixed with delicious crisp vegetables for a nutritious dip, rich in antioxidants, vitamins and fiber and are available in the deli section in three flavors: Garden Vegetable, Mango Lime and Southwestern. 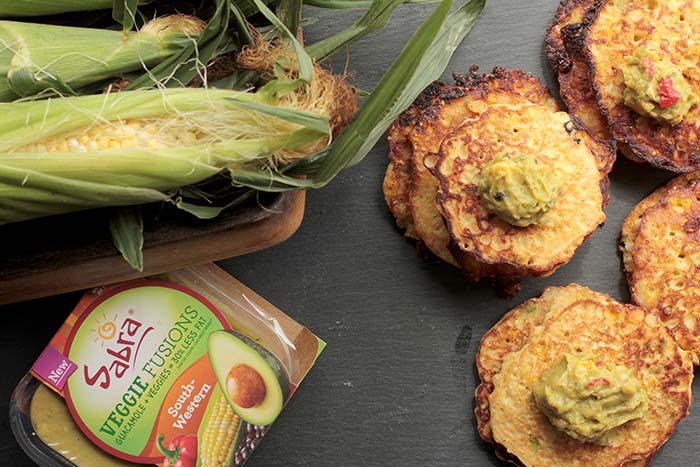 A first of its kind to hit the grocery stores, all three varieties are vegan, kosher, gluten-free and made with seven different varieties of real crisp vegetables per recipe – and they have 30% less fat than a classic guacamole without sacrificing flavor – a total win. 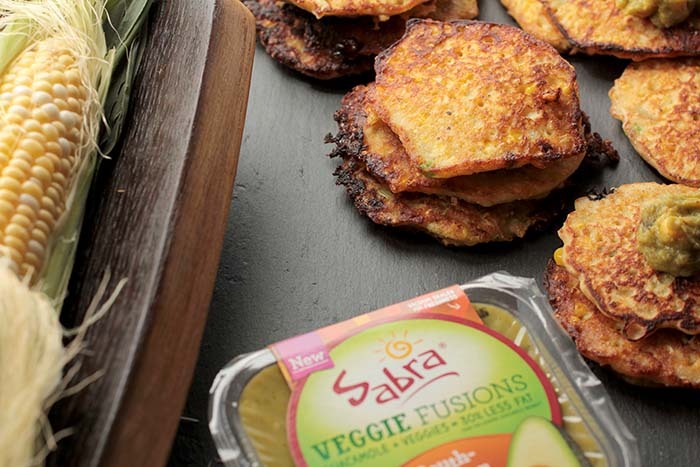 Sabra is giving away a $1 coupon so you can #VeggieUpYourGuac – try the new Guacamole Fusions and do make these little corn cakes. Happy Summer!